Jenkins is a tool for watching or managing jobs. Either external like cronjobs or executing "build and test" jobs of your Django projects. There is even more, but in this article I'll focus on a basic Jenkins setup - building and testing a Django project. 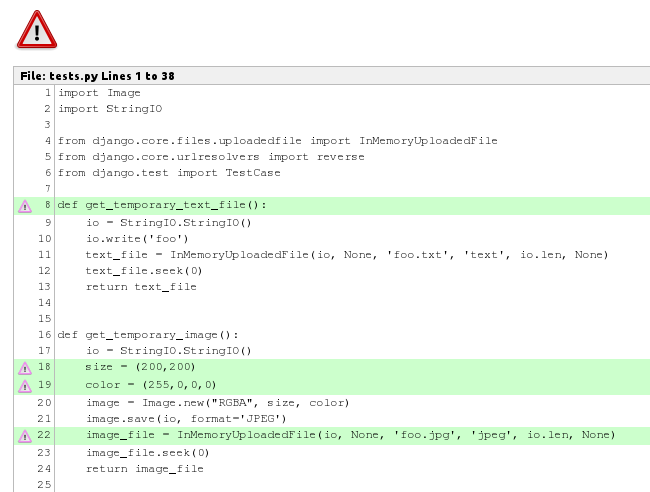 For Django there is django-jenkins that allows an easy integration with Jenkins tools like nice visualization of code coverage, pep8/pylint/pyflakes code violations. In this article I'll setup a local Jenkins configuration that will look on a folder with the code. In real world Jenkins would watch a repository and execute a job when a new changeset shows up. On Jenkins web page we can find packages for various OS. We can also download a WAR file for local execution (you will need a JAVA JRE and maybe few other dependencies). The main part of the page are jobs (none at first run). On the left we have a menu with few handy elements. "New" can be used to add new jobs. 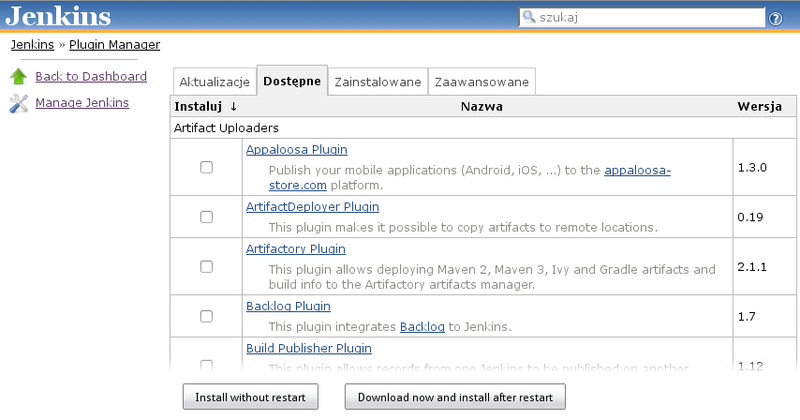 "Manage Jenkins" allows configuring Jenkins and also installing plugins - and we need few for django-jenkins. For django-jenkins we need two plugins: Violations and Cobertura. For local tests also File System SCM plugin will be useful. After installation you may need to restart Jenkins for them to appear as installed. If the plugin list is empty try to download it by going through tabs or hitting the install button. Click on "New" and create new job. Enter a name and choose "Build a free-style software project". If you already have a similar job you can copy it too. Usually Jenkins would look on a repository for changes, but using File System SCM we can use a plain local folder with a Django project. Good for playing with Jenkins. Poll SCM will make Jenkins check the given repository for any changes since last build. If there will be new changes it will launch the job. The */30 * * * * means that it will check every 30 minutes. Usually for build instructions we would give dependency installation and then run all tests we need. In this case I have everything installed on the local system so I just launch tests. manage.py jenkins is a part of django-jenkins (more on that later). 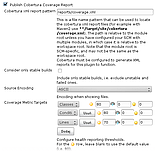 It will launch tests and create reports files used by Jenkins. Jenkins is configured. We just need to add django-jenkins to that project and it will work - Jenkins will build the applications and create reports. We also need to install other python packages: pep8, pylint and pyflakes. After that you can test everything executing manage.py jenkins. If it succeeds then the project is configured and ready for action with Jenkins. What Jenkins can tell us? Console: log from the executed tasks. Sometimes it may fail at downloading packages from pypi. You can retrigger a task to repeat it when pypi is online again. 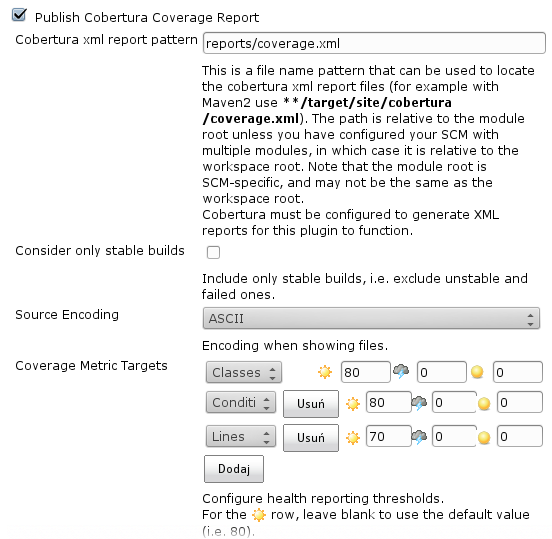 Coverage Report: reports about code coverage with visualization of branches/conditionals coverage. 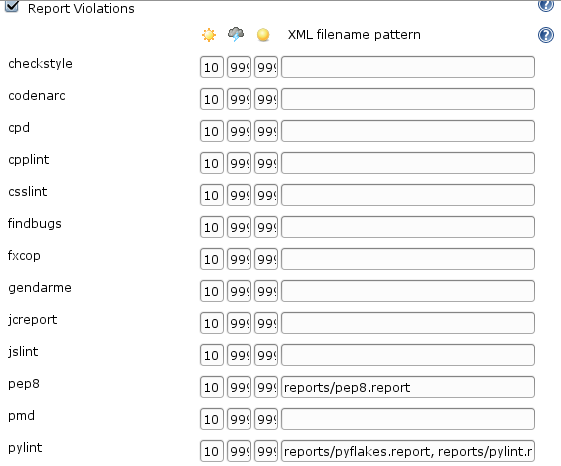 Violations: This will cover pep8, pylint/pyflakes violations. You will find more info on django-jenkins Tutorial and Continuous Integration with Jenkins.